Airsoft vs. The Real World | Strike - Hold! Our friends over at Kit-Up! posted a story recently about a US Air Guard unit looking to purchase airsoft guns for use in CQB / MOUT training. While this is good news for some airsoft retailers, and probably also makes many airsoft players feel better about their sport too, it does raise an interesting question: Is there really a proper place for airsoft weapons in a real-deal training environment? And if so, how and when should they be used? During my 4 year term of enlistment I was trained in the standard US Army doctrine and tactics of Military Operations in Urbanised Terrain (known as FIBUA – Fighting In Built-Up Areas – in British Army parlance, also jokingly referred to as FISH – Fighting In Somebody’s House). During my military service, our standard small arm was the M16A1 and we used the complicated, expensive, clumsy and often unreliable MILES gear during MOUT training. As you can probably tell from my choice of adjectives there, I was not particularly impressed with the old MILES system. The new MILES 2000 system is much better, and does provide a far greater degree of flexibility, data collection and battlespace management for exercises involving greater numbers of soldiers. Yet however good these systems are, they still carry the baggage of high cost, complexity and extra encumbrance for the individual soldier. Now along comes airsoft. The first time I played airsoft in a CQB / urban environment, about 6 years ago, I was immediately struck by its potential value as a real-deal training aid. A theme I pursued in a section called “Airsoft in the real world” for an airsoft magazine I was writing for at the time. 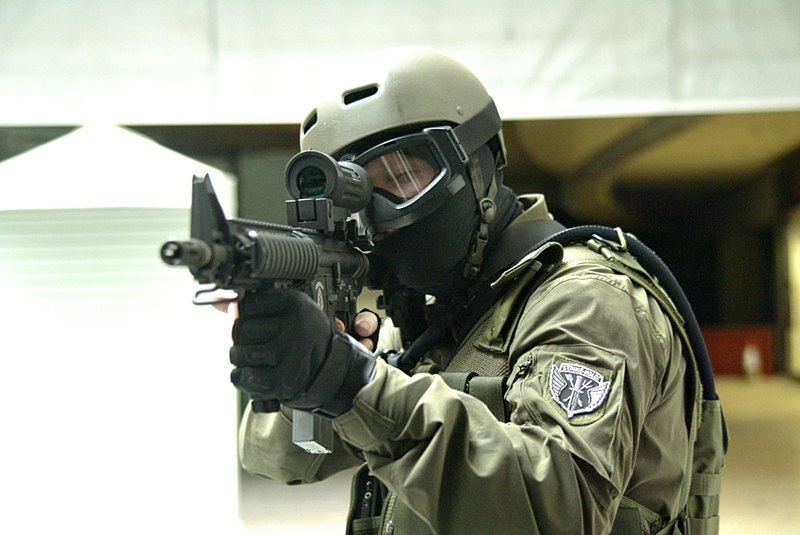 Even back then, there were examples of “early adopters” who were using airsoft weapons in their CQB training syllabus – companies like HSS International, SIG-SAUER Academy, WASF, and Stirling Services, and real-deal units like the Illinois National Guard and the RAF Regiment come immediately to mind. What all of these “early-adopters” had realised was that airsoft provides a far more realistic training solution than paintball or “blue guns”, is far more cost-effective than MILES and also significantly cheaper and safer than simunitions. But beyond cost, realism and safety advantages, there are several other benefits also worth mentioning. Firstly, apart from the clear or coloured-body “toy” end of the airsoft spectrum, these imitation guns are highly realistic looking and are “full size” – so the user sensation is virtually identical to the real thing. The benefits of this vs. paintball guns (for example) should be obvious. Secondly, they replicate virtually all of the functions and characteristics of the real firearms they represent (the main difference being that you don’t need to cycle the action or release the bolt catch when you need to change magazines – except with gas blow-back type weapons). Thirdly, the “professional” end of the airsoft replicas spectrum delivers guns that are made of extra robust materials to handle the rigours of serious training. Their internals are also high-quality to deliver the kind of reliable performance needed. Fourthly, many of the best guns now even faithfully replicate features like quick-change barrels, “bolt” assemblies, stocks, etc. – and most models can also take tactical / tacti-cool accessories like vertical fore grips, laser aiming modules, reflex sights, taclights, etc. So, your airsoft training weapons can be kitted out exactly in the same way as your real-steel armoury. Once again, this is a level of realism is something that is only matched by real firearms. Finally, with airsoft weapons, once the day is done you simply sweep up and dispose of the BBs. There’s no need to spend a lengthy amount of time gathering up (expensive) blank cartridge cases, or to wash down your equipment and clothing to remove paint splatters. That might not sound like a big deal – but an hour spent on training rather than admin has to be a good thing, right? So there you have it. What other weapon platform delivers such ability to safely, economically and realistically practice and train on your tactics, tips and procedures for CQB/FISH or hostage rescue type scenarios? Well, to state the bleeding obvious, these aren’t of course real firearms made from weapon-grade metals and polymers – so they’re not as robust as real guns and you’re going to need to handle them with more TLC than you would a real gun. Secondly, their internal operating systems are completely different from an actual firearm, and whether you use a compressed gas or electric battery operated replica you’re going to have to contend with the specific quirks that each of these options brings to the party – such as gas guns not performing well in colder temperatures or suffering from leaking seals, and electric guns not liking to be immersed in water and batteries dying at inopportune moments. Thirdly, like any specialised equipment, somebody needs to get trained in how to properly manage, maintain and repair your airsoft guns – but it’s easier than you might think and certainly a skill set that the unit armourer could add to his or her repertoire. The other things that some people like to make a lot of noise about with regards to airsoft weapons are with regards to range and accuracy. So, let’s be clear about this. Yes, airsoft guns are short-range weapons – because they shoot a lightweight plastic BB at low velocities, the maximum practical range for airsoft sub-machine guns and assault rifles is around 200-250 feet (50-75metres) realistically. Also, and for the same reasons, the useful accuracy for airsoft sub-machine guns and assault rifles is also limited. But I want to put a very clear caveat around the accuracy point – it is actually fairly easy to tweak and improve the out-of-the-box accuracy (and range) of airsoft rifles and submachine guns by properly adjusting the hop-up unit (which controls the spin put on the BB), installing higher quality hop-up rubbers and also by installing tight-bore (and/or rifled) barrels. But even without these kinds of special modifications, a trained shooter will be able to consistently get multiple hits on a man- (or woman-) sized torso target by aiming centre-mass – within the appropriate distances. Most of the moaning about airsoft accuracy that I’ve heard has come from people who’ve only used a “cheap-soft” weapon, or because they’ve not adjusted the hop-up properly, or (more commonly) because they just couldn’t shoot properly to begin with. Could airsoft be even better? Well, yes, of course – there’s always room for improvement. In terms of making the user experience even more realistic, a high-pressure air or gas blow-back operating system provides a feeling much closer to the real thing than an electric system does. However, the “automatic electric gun” (AEG) type is still the most common, and reliable, system available and by a very large margin. And within the realm of the AEG, Systema and CTW produce a category of airsoft replicas known as professional training weapons. Manufactured to very high standards using aircraft grade aluminium, stainless steel and high-strength polymers; these are the most reliable, most robust, most realistic, and most expensive airsoft replicas on the market. 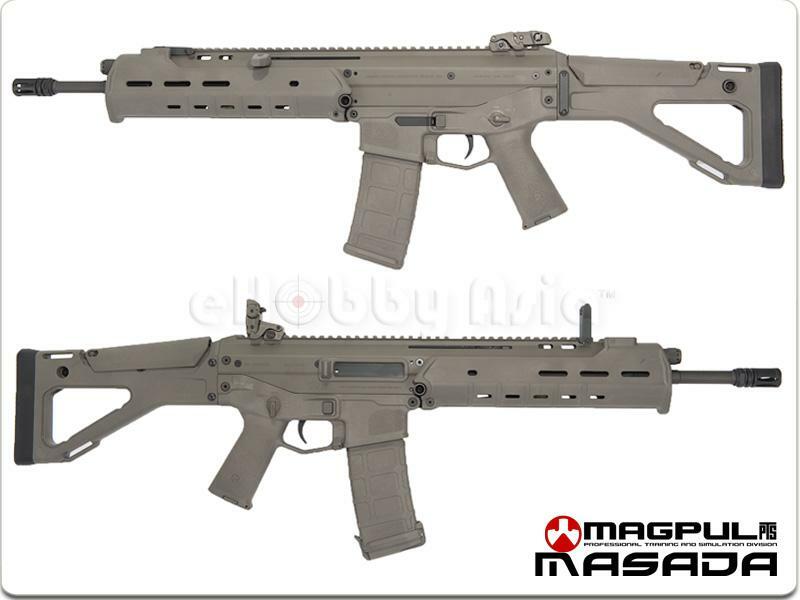 Also at the “professional” or “semi-professional” level, but easier on the wallet, are products from the stables of MagPul PTS (professional training and simulation division of MagPul Industries) and Madbull Airsoft. Both of these companies produce very high quality airsoft replicas of real-steel weapons and accessories – in the case of MagPul PTS its replicas of MagPul’s own products, in the case of Madbull its replicas produced under license from a wide range of real-steel firearms companies. *Note: apart from the phonetic similarity in the names, there is no connection between MagPul and Madbull. 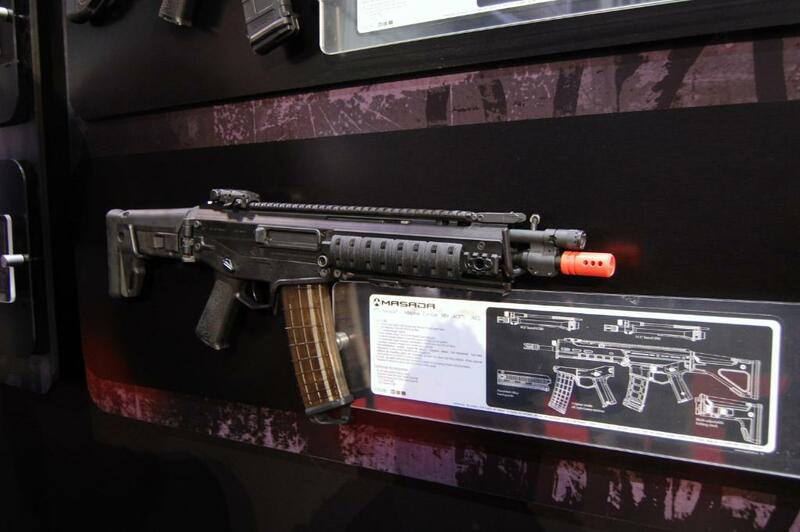 But, thinking even further about the ideal airsoft gun for professional training use; it should really use a reliable gas/air powered mechanism (with an internal or external air/gas supply), feed from standard AEG magazines, and its bolt and bolt carrier would “blow-back” as well – for that added bit of extra realism. All of this would have to come in a package robust enough to handle the rigours of professional training environments too of course. In the past couple of years, more and more gas blowback operated skirmish-level airsoft assault rifle replicas have begun to become available. Many of them have suffered from reliability issues however, partly becuase they have pretty much all relied upon the so-called gas-in-mag system as opposed to gas-in-gun. This requires the use of specialised (and expensive) magazines and increases the number of parts that can break down. As I learned the hard way a few months ago when I took one out for a trial run at a CQB skirmish. But on the other hand, some of the gas-blowback powered SMG replicas on the market are truly outstanding – and great fun – especially those that utilise the new System 7 gas system. However, if only one of the leading airsoft companies developed a workable gas-in-gun approach and commercialised it to a further degree then the prices would come down and reliability would go up – and it might just revolutionise the sport of airsoft skirmishing along the way as well. Here at Strike-Hold! we’re all avid airsofters, whether it’s a casual skirmish or a challenging mission-oriented milsim event – and we make no apologies for that. We were also the first – and as far as we know still the only – blog/webzine to feature real-deal and airsoft content under the same roof, so we think we have a pretty good perspective on this topic. Of course airsoft has to be used in conjunction with your live-fire exercises and range time, but it does provide some very real benefits for close-quarter, force-on-force, gunfighter training. Beyond the cost, safety and after-action bonuses, using airsoft weapons allows you to really train-as-you’d-fight to gain the tactical advantage when you go into harm’s way. But what do you think? Is using airsoft in CQB / FIBUA training a good thing, or not? You’re currently reading “Airsoft vs. The Real World,” an entry on Strike - Hold! There are already several US Air National Guard units using airsoft for training, both woodland and MOUT. The Michigan Air National Guard is one, and they use mostly Classic Army M15A4’s, M249’s, SLR105’s (for OPFOR) and the KWA M9 PTP. For the amount of a single training exercise budget they were able to buy airsoft weapons, magazines, BBs, gas, etc. for two years worth of training. One drawback I didn’t see mentioned is the tendency for folks to mistake airsoft cover for true cover from small arms fire. When a bush or sheetrock wall is effective cover from airsoft pellets, true warriors can develop some potentially lethal habits. This isn’t a fatal flaw in airsoft training–I think you did a good job covering the many positive aspects–but it’s certainly something to be aware of and address. Thanks Blake – the same caution would apply to Simunitions, MILES and any other non-lethal training system though. The proper use of cover, firing positions, immediate action drills, camouflage & concealment, comms, etc. are all things must also be learned and practiced until they become reflexive and instinctive – in addition to the kinds of gunfighting tactics and procedures that airsoft-based training could help with. Lack of weapon blast and muzzel flash is an issue imo. Someone needs to create an add on that does this. Well, but still it is more then nothing. More then just a splash or saying BUM BUM YOU ARE HIT. Modern Co2 ARG gives preaty nice kick back, but still distance is not the same. But hey, you cant get all… Only in war you feel like in war. “It was a tactical training for their men. And it’s the closest they couldget to a real firefight without somebody getting hurt”. Cant rem who sed tho. I play airsoft 6 years already. 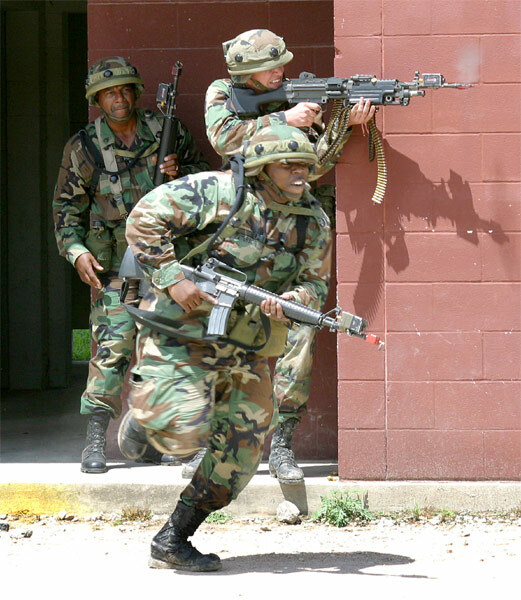 Have no military beckground, but some times we have training with military force. guys agree that airsoft has its benefits for shore. And yes, awsome site. Every morning cup of coffe and this makes my day, Keep on good work brother.